Almost every choice we make in life is motivated by one of two powerful forces….the desire for pleasure and the fear of pain. Although we say that we don’t want to feel pain if we can help it, the prevailing force for many is the desire for pleasure regardless of the pain that comes with it. This explains a lot when it comes to health and wellness. How many times have I heard “there is no way I’m giving up my sodas” even when I’ve had the opportunity to scientifically demonstrate the dangers associated with their habit? It doesn’t seem to matter that there will be a long-term price to pay or that their health will eventually be lost because of it. They’re living for the moment and they chose pleasure over pain almost every time. Undoubtedly they are addicted to their pleasure (and their sodas). The next generation is suffering because of the pleasure choices we continue to make – exposure to radiation, pesticides, GMO’s, BPA, Aspartame, etc., are just a few of the things that are causing a lot of pain for the next generation. Whether you can see it or feel it yet is not relevant.…you (and your family) will ultimately pay the price for your pleasure-driven health decisions. When things like autism, arthritis, kidney disease or cancer strike your family don’t say I didn’t warn you. There is an old saying that goes like this. – “no pain…no gain”. Nothing could be truer when it comes to making wise decisions about your health. Isn’t it time you set aside your pleasures to protect your health and the health of your family for generations to come? You might miss the pleasure you get from a bottle of soda but you’ll be avoiding pain later on and your body will thank you for it! You may suffer with a little inconvenience by refilling your water bottle with water that’s actually GOOD for you, but you’ll get used to it eventually and your body will thank you for it! You might feel the pain of having to read food labels and look up all of those words you don’t understand but you’ll learn in time and your body will thank you for it! Will you continue to chose your reckless pleasure over the painful consequences and roll-the-dice on your health or are you ready for a little pain that comes with healthy change? CLICK HERE to learn more about the water you’re drinking BEFORE you take another sip! The most miraculous “invention” in the history of the world is the human body and yet we underestimate (and undermine) its ability to do what it was designed to do without blinking an eye! Most lab coats with prescription pads won’t tell you about those “natural” things that would address the underlying problem in hopes of avoiding medications altogether. But in their defense, they’re trained and paid to treat…not cure. That makes a lot of sense when you consider that there is NO CURE FOR ANY DISEASE whatsoever! 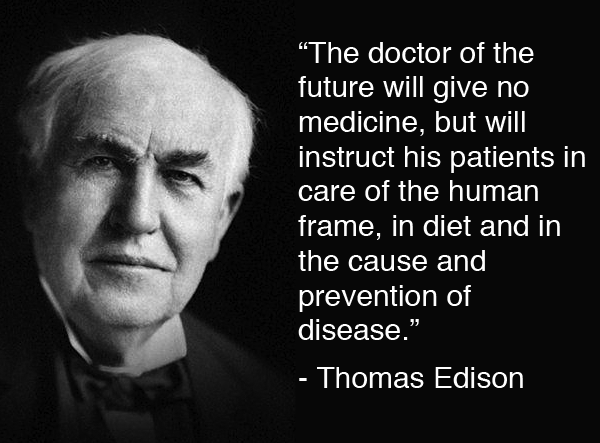 I’d much rather do my part to CURE the problem than treat the symptoms any day! As miraculous as the human body is, it only needs a few things to sustain health – but most people prefer to go with (what they perceive to be) a quick fix instead of putting in the effort to heal. To some, their doctor has become their god. Most people just can’t resist opting for a low co-pay in exchange for spending a little hard-earned money on healthier food (and water), cleaner air, supplements (to make up for what the body lacks) or fresh air and exercise. For them, it’s much easier to fill a prescription, and they sabotage the body’s natural ability to “heal itself” in the process. There is plenty of science behind some of those “natural” things the body needs and you don’t have to look far to find it. Refrain from food laced with pesticides as well as processed foods and you’ll see an amazing difference! Refrain from bottled water laced with chemicals and plastic particles and trade it for healthy water and you’ll see an amazing difference! Refrain from being glued to the television for hours on end and trade the time for a walk instead and you will see an amazing difference! Refrain from a broken belief that all the nutrients you need are found in your Big Mac and give the body supplements in exchange and you will see an amazing difference! Everything that we need to sustain health is already at our fingertips and it doesn’t come in a prescription bottle. For instance, there are lots of supplements that address lots of things – there are even a few natural herbs that are so POWERFUL that pharmaceutical companies have attempted to get them approved by the FDA so that they can be prescribed – turmeric is one of them. Lipitor/Atorvastatin (cholesterol medication): In a 2008 study published in Drugs in R & D, turmeric performed just as well as atorvastatin (Lipitor) for correcting the underlying pathology that causes oxidative stress in the blood vessels – endothelial dysfunction. Not to mention, turmeric does not incite horrific side effects like statins do, such as mitochondrial dysfunction, muscle wasting, and cognitive impairment. Metformin (diabetes drug): Your DNA does not have to be your destiny! In 2009, researchers found that curcumin “activates AMPK, allowing for increased glucose uptake. Curcumin also suppresses gluconeogenic gene expression in hepatoma cells, allowing for glucose production in the liver”. Prozac/Fluoxetine (antidepressants): A study published in a 2011 issue of Acta Poloniae Pharmaceutica showed how curcumin can reduce depressive behavior in animals. A 2015 study found even more promising results in humans with major depressive disorders. Reversing liver disease: Curcumin possesses such great antioxidant and anti-inflammatory effects; it can reverse liver disease caused by excessive alcohol consumption. Curcumin heals where chemotherapy fails: A 2010 study published in TNO Nutrition and Food Research finds that curcumin has value in treating cancer cell lines that do not respond to chemotherapy. Instead of spending time researching the latest and greatest pharmaceutical, maybe it’s time for you to research what your body needs to take care of the healing process on its own! Everything you need to be healthy was provided at the time the greatest “invention” in the history of the world came along. All you have to change is your mindset! Have you read this Amazon #1 Best Seller? Read it before you take another sip of water! I was in the real estate business for many years so I’m very familiar with E.coli contamination in wells. The source of E.coli is feces from of humans (and other mammals) so it shouldn’t come as a surprise that E.coli is often found in rural wells. After all, what is on the ground surface will eventually find its way into the water source. Acceptable Levels of HUMAN WASTE in municipal water – 3 to 20%! The municipal water from my town was just confirmed to have E.coli contamination and “safety precautions” have been issued. I have to laugh when the locals express their shock over “how this could ever happen”! Little do most of them know, their municipal water is just recycled sewage with acceptable levels of solid human waste in the 3-20% range. With that in mind, you can bank on having a little E.coli from the feces in your water every once in a while! The chemicals that it would take for remediation to remove ALL contaminants in municipal water would be enough to kill off a small country. Instead, we ingest a few hundred chemicals and we live with the consequences. Far too many people believe that commercially bottled water is the “safest” water you can drink. Not only is it not any safer than your tap water, it is wreaking havoc on your health in ways you can’t begin to imagine. Ignorance about bottled water could be your biggest downfall when it comes to your health and the scam behind the process is enough to make Bernie Madoff look like Mother Theresa. Recently millions of bottles of bottled water were recalled by Niagara Bottling company (based out of Canada) due to E.coli contamination. If this water comes from a deep source natural spring as implied by Niagara, who (or what) pooped in the water? I’m not sold on the concept of a natural spring any more than I believe that I can buy oceanfront property in Arizona. If the water source for the Niagara brand waters is like most of the other commercially bottled water sources, it’s coming from the local tap and not some mysterious “spring” somewhere. How does it feel to buy your local water twice? How did E.coli from feces find its way into the supply? Niagara issued a statement saying its disinfection process would have kept E.coli out of its bottled water even if tainted water made it into the plant. If that’s the case, how did E.coli sneak into the bottled water? So much for the “disinfection process”. Niagara spokesman Stan Bratskeir said contamination was found at a water provider, Far Away Springs, based in Auburn, Pa. He said no contamination was found in the water obtained from Far Away Springs or in Niagara’s own finished products. What is my point to this rant of mine? You betcha! My point is that you need to take control of the water you’re drinking, otherwise accept the feces and the cancer causing chemicals and call-it-a-day. If you’re banking on the FDA to watch out for you; think again. The FDA doesn’t test commercially bottled water. You’re on your own. I’ve taken control of my water source once and for all. You won’t find chlorine or fluoride in my water. You won’t find parasites in my water. You won’t find E.coli in my water. You won’t find (up to) 300 legally allowable chemicals (many known to cause cancer) in my water. You won’t find pharmaceuticals in my water. You won’t find ANY amount of feces in my water. You won’t find me tipping toxic water bottle to my lips…EVER. Now you know “the rest of the story”. If you continue to drink water bottled in plastic known to have as many as 20,000 chemicals, do it at YOUR OWN RISK. As for me and my family….it’s only THE BEST. I really would like to know who (or what) pooped in the water. ARE YOU READY TO TAKE CONTROL OF YOUR WATER ONCE AND FOR ALL? CLICK HERE to learn more about the water you drink before you take another sip! We have no problem telling our kids not to talk to strangers…but it doesn’t seem to matter if we have our kids drinking, bathing in, and eating food prepared with water that was once flushed down a stranger’s toilet. In a world where most people don’t even care to know their own neighbors, it’s pretty bizarre to think that they’re okay consuming the waste of total strangers! Hmm…. Have you ever wondered why we host drug drives to collect unused pharmaceuticals? It’s not just so that they don’t end up in the “wrong hands,” it’s so they don’t end up in the tap. Whatever is flushed down the toilet eventually makes its way back to the tap…whether you SEE it with the human eye or not! So, who’s waste are you and your family drinking (bathing in and cooking with) today? WHAT YOU DON’T SEE IS HURTING YOU! Most people admit to being visual learners….I wonder if most people would still drink, bathe in, and cook with their tap water IF they could see with the human eye what’s actually in their water? What IF you could see the human waste…the pharmaceuticals…the laundry detergent and cleaning products…the lead? What if you could SEE the chemicals (upwards of 300) used to make water “potable” – some that are known to cause cancer and disrupt your hormones? What if you could see the journey it makes from YOUR flush where it’s mixed in with waste water and the flush from thousands of strangers? Yuck. What if you could SEE the toilet paper particles that are admittedly the biggest “contaminant” in our tap water? What if you could see the bacteria that has become resistant to chlorine or the virus that makes it way through all the chemicals? Would you still be content to drink, BATHE IN, and COOK WITH it? Maybe it’s time for the adults to stop playing make-believe. What you don’t see IS hurting you…slowly and surely. The Environmental Working Group (EWG) conducted a study LONG AGO on the umbilical cords of 296 newborn babies and they found hundreds of traces of pharmaceuticals and contaminants in each one. God only knows what they’d find if the repeated that research today! Our babies are “seeing” all these things before they’re ever born, and they’re labeled as being “pre-polluted” by the N.I.H. – the leading medical facility in the world. When is enough of what you can’t see enough? Isn’t it time take action of your own to STOP your exposure to all those things you can’t see with the naked eye? If not, enjoy getting more personal than you ever imagined with strangers from all over town! CLICK HERE to read more about water problems AND SOLUTIONS! With problems like ours, it’s no wonder it’s a Best Seller on Amazon! It’s a shame that it comes down to a “paper or plastic” decision when making a choice about which water to consume – but that’s a very real dilemma in America today. 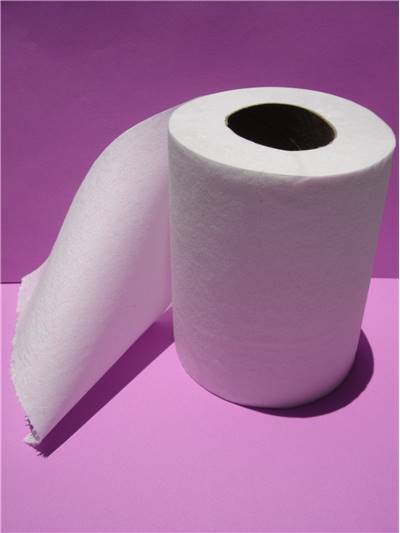 The #1 contaminant in city tap water IS toilet paper.…yuck…while the #1 contaminant in a plastic water bottle IS plastic particles…thousands of them! We’ve got BIG “paper or plastics” problems BEFORE we even address all the chemicals that are known to cause cancer and disrupt hormones found in the tap and bottle! What you DON’T see CAN hurt you and it’s hurting you in ways you can’t begin to imagine! WE SHOULDN’T NEED TO ASK OURSELVES “PAPER OR PLASTIC” WHEN IT COMES TO WATER! We’re at a breaking point in America. Our cancer rate is just shy of 50%…1 in every 2 males and one in every 2.2 females WILL get cancer at some point in their lifetime. The rate of autism is 1 in every 50 children; 1 in every 35 on military bases. There are several reasons for the climbing rates, and it’s nearly impossible to change it all – but the single most important thing…the easiest thing to change…the one thing that we must consume to stay alive…the one thing that makes up 70% of the human body is water…our most important nutrient…water WITHOUT paper or plastic or cancer causing chemicals in it! JUST SAY “NEITHER” TO PAPER AND PLASTIC! My advice to you is to stop living in the past when it comes to water and everything it touches…from the inside to the outside of you. Things have dramatically changed in your lifetime and it’s time to take a closer look for the sake of your health, the health of your loved ones, and the health of the planet too! Our “recycling” system has failed and we’re not recycling 90% of the plastics we’re using…they’re landing in the landfill despite your efforts to be responsible! “IN THE BEGINNING” WATER WAS CLEAN, SAFE AND HEALTHY! TODAY IT ISN’T! So, what’s it going to be for you and your family? Paper or plastics? If you don’t like the idea of either one, there IS a better way and I’m happy to share it with you and your family! In the meantime, good luck sustaining your health when the most important nutrient for your body is filled with paper or plastics! CLICK HERE to learn MORE about the water you’re drinking! Chances are you’ll never look at water the same again! “Plop, plop, fizz, fizz oh what a relief it is.” Many of us remember that catchy jingle from the Alka-Seltzer commercials of the 1960’s – but it doesn’t seem so cute when our BABIES are born with acid reflux these days! Billions of dollars are spent on antacids each year. In fact, Nexium is the third biggest seller in the world with annual sales exceeding $5 billion. Priolsec is the #1 selling drug in the world making over $6 billion dollars a year. But antacids do not fix the root cause of the problem and the side effects are costing you BIG TIME. I think its fascinating that just when we gave “heartburn” a new and much more serious-sounding label (“acid reflux”) we just happen to have a billion dollar pharmaceutical solution for this condition that is striking our society from cradle to grave. It doesn’t even seem possible that our newborns are commonly diagnosed with having acid reflux! Just imagine your reaction if the pediatrician told you that your newborn was suffering from heartburn…that wouldn’t be so easy to digest (pun intended). Heartburn used to be a problem mostly for senior citizens…today it begins at birth…a sign that the body is in acid overload! It’s rarely a good idea to throw pills at a problem! Pills don’t cure the condition…they merely mask your symptoms…and they often come with side effects that makes things MUCH worse in the long run. Sometimes taking a pill is just the lazy way out. Instead of making sacrifices for good health, it’s a whole lot easier to just take a pill and forget about the real problem. That’s definitely not a good idea when it comes to acid reflux! HERE’S WHAT THE EXPERTS HAVE TO SAY! Dr. Yu-Xiao Yang: MDA study of 145,000 seniors showed heartburn drugs can increase risks of broken hips. These drugs block absorption of calcium, leading to weaker bones and fractures , The drugs causing the most problems in this study were Nexium, Prevacid and Prilosec. Acid reflux meds were not intended for long-term use. Even the over-the-counter “harmless” options come with a warning label and a reminder that they are for SHORT TERM relief and NOT continued use. Instead of relying on pills that do MORE HARM than good, consider changing your lifestyle instead. Stay away from acidic foods, and acidic drinks (including bottled water). Stop inhibiting the body’s natural digestive system by medicating for something that can be easily managed. Trade your “Alka-Seltzer” potion for ALKALIZED water. Your body will thank you for it and the pharmaceutical companies will have plenty of other rabbits victims to chase. JUST BY CHANGING YOUR WATER, YOU COULD DRAMATICALLY CHANGE YOUR HEALTH! CLICK HERE TO FIND OUT HOW AND WHY! Have you ever wondered what started the search for the “Fountain of Youth”? There are lots and lots of “healthy” things that could have been sought out to slow the aging process. Why water? History has proven that legends usually have a glimmer of truth behind them. The search for the “Fountain of Youth” isn’t nearly as far-fetched as you might think it is. After all, water is the most important nutrient for the human body. It only makes sense that somewhere, someone experienced health benefits just by drinking water from a “Fountain of Youth”. Tales about the “Fountain of Youth” have been recorded across the world for thousands of years. In 1513 Ponce de León discovered Florida while in search of the Fountain of Youth. During the 16th century Bimini was rumored to have water with “restorative powers”. The health and longevity of the Caribbean people during that time served as confirmation of the “Fountain of Youth” rumors. In 1767 Jackson Spa in Boston was selling “medicinal water” (aka water from the Fountain of Youth) for $1.75 a pint! It is reported that people traveled far and wide to purchase this medicinal water – there must have been something very special about that water for people to spend over a month’s wages on a pint of it! The Hunza Valley tribe has been studied by experts for the past 6 decades because of their amazing longevity, lack of disease and exceptional I.Q.’s. Although a stress-free lifestyle and a natural diet can’t be overlooked, scientists have concluded that their water source is nothing short of a “Fountain of Youth” and that a lifetime of this water can be credited for their health and longevity. You can find a Fountain of Youth in a few places in the world today. Millions of people each year flock to Lourdes, France and Tlacote, Mexico to drink water with healing properties. Test results have proven that these waters can be considered “water with life” and they positively have “healing properties” due to the active hydrogen naturally present in these waters. If you’ve got all of the time and money in the world I guess you can set out across the globe in search of THE Fountain of Youth. – but that plan sure doesn’t work for me! I have my own Fountain of Youth in my home and I can produce an endless supply of water from it 24/7 for my family and friends. My water is produced by a high-tech device that restructures my tap water into a MIRROR image the healing waters found naturally in just a few places int he world today. The health benefits to me and my family have nothing short of miraculous and the long-term benefits are immeasurable. Purchasing a device that takes my source water “back to origin” has been the best investment I’ve ever made for my family. For the price of one round-trip ticket to Lourdes, France or Tlacote, Mexico I’ve got a solution that will last for decades! There are already 30 million people drinking my water from a “Fountain of Youth” water device. Would you like to have access to an endless supply of water from your own Fountain of Youth for you and your family too? If you answer “no”, then you’re overlooking the obvious. If you answer “yes” then you need to ask me how so that you can begin reversing your aging process just like me! CLICK HERE to read more about the water your’re drinking before you take another sip! Sleep study clinics are popping up all across America. Today there are almost 3,000 clinics with hundreds more in the works for certification and approval to do sleep disorder diagnostics. A few short years ago we’d never even heard of sleep apnea and yet millions of people weren’t mysteriously dying in their sleep (as we’re led to believe will happen). Today it is reported that 5% of Americans suffer with some sort of serious sleep disorder (with “many more not yet diagnosed”). What in the world is going on? When the muscles relax, your airway narrows or closes as you breathe in, and you can’t get an adequate breath in. This may lower the level of oxygen in your blood. Your brain senses this inability to breathe and briefly rouses you from sleep so you can reopen your airway. This awakening is usually so brief that you don’t remember it. Now that we understand the definition of sleep apnea and how this disorder blocks the airways, etc., aren’t you even a little bit curious about what causes it in the first place? For a short season, sleep apnea was considered to be a condition (almost exclusively) of overweight, middle-aged men. Today we have sleep study facilities exclusively for young children…overweight and otherwise. Clearly this isn’t just a problem of overweight, middle-aged men. We’ve got a serious problems! I’m not a physician and I don’t attempt to give medical advice; I’m just a common-sense-kind-of-gal. In this case, my common sense is thirsting for the root cause of this mysterious 21st century medical condition defined as sleep apnea. I believe that your complex CPAP breathing unit is serving you well by forcing air into your airway (masking your symptoms) but it sure isn’t helping you identify the root cause of your problem. The “mainstream medical” community has become experts at masking symptoms with pharmaceuticals and treatments for everything that ails you. When we can’t put a label on your problem, there’s no need to worry. We’ll write a prescription for depression and/or a narcotic for pain. Personally I’d rather know what’s causing my problem in the first place so that I can (hopefully) correct it INSTEAD of managing (and masking) my symptoms. Darn! There goes my common sense again! It’s amazing to see what the body is capable of doing for itself if you just give it what it needs. Deprive the body of what it needs and you’ll pay the ultimate price for it! The need for a CPAP device just might be the least of your problems! The typical prescribed fix for apnea is a continuous positive airway pressure (CPAP) machine that pumps pressurized air through a face-mask, forcing the user to breathe throughout the night. Prices for the machines range from less than $200 to more than $5000, with an estimated US market of about $10 billion annually. NO WAY TO AVOID IT! Contrary to popular belief, not all water is created equal. If you want to experience a healthy turn-around, you’ll need healthy water that is structured in such a way that your body can absorb it at the cellular level the way it is intended to do! It takes serious water to do that job! Hydrate your airways (and all of the rest of you) and see what happens! You never know…you just might be able to retire your CPAP contraption AND keep a happy spouse all at the same time! Are you willing to try something as simple as changing your water for improved health or are you too closed-minded to consider the possibilities? Try it for FREE….see for yourself! The only thing you stand a chance of losing is your CPAP! CHANGING YOUR WATER CAN PROFOUNDLY CHANGE YOUR LIFE!